This style makes an ideal privacy fence. It is available in 5' and 6', and the maximum length of section is 6'. The square lattice panel is constructed using a 6" square with a custom bend on the cap rail. The height can vary anywhere from 3' to 6' and the maximum length for the panel would be 8'. Additionally, the square can be made tighter or larger based on the customer's preference. 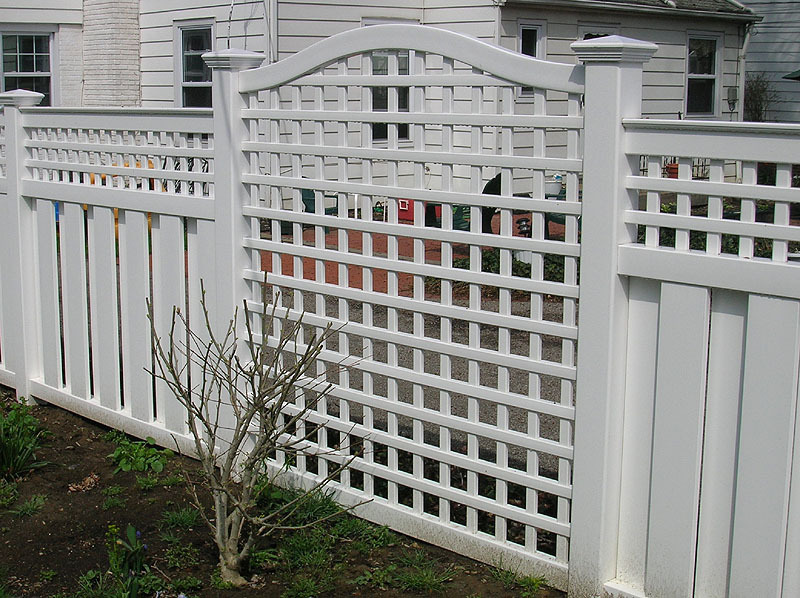 Elyria Fence customers also have the choice of diagonal lattice instead of square lattice. All of the vinyl fences are available in white, tan. There are a variety of vinyl manufactures. As a company we thoroughly researched the majority, and feel extremely confident in our manufacturer, Plygem (aka Kroy Building Products). They provide a product that we are pleased to hang our company sign on. Our manufacturer also provides a lifetime warranty. Please note, however, that vinyl will not work in every situation. It will not provide the strength and durability that is offered in a wood or ornamental steel or aluminum fence. It is only maintenance free in terms of the painting.For a more objective look on a few of the popular brands of vinyl currently on the market, take a look at this blog by clicking here. For the convenience of our customers we provide installations year around, however, be sure to plan ahead on your installation. The summer months are very busy, and this will allow us to accommodate for your holiday parties or pool installation. Contact one of our estimators for a free appointment to discuss design and pricing options. Don't be fooled by our name - Elyria Fence has been pleased to offer our Vinyl Square Lattice fence designs for installation in the following Ohio cities for 84 years: Akron, Amherst, Ashland, Avon, Avon Lake, Bainbridge, Bath, Bay Village, Beachwood, Bedford Heights, Bellevue, Berea, Berlin Heights, Birmingham, Bratenahl, Brecksville, Broadview Heights, Brooklyn/Old Brooklyn, Brookpark, Brunswick, Carlisle Township, Catawba, Cleveland, Cleveland Heights, Clyde, Columbia Station, Cuyahoga Falls, East Cleveland, Eaton, Elyria, , Fairview Park, Fairlawn, Garfield Heights, Gates Mills, Grafton, Hinckley, Huron, Hudson, Independence, Kelly's Island, Kipton, LaGrange, Lakeside Marblehead, Lakewood, LaPorte, Litchfield, Lodi, Lorain, Lyndhurst, Macedonia, Maple Heights, Medina, Milan, New London, New Russia Township, North Olmsted, North Ridgeville, North Royalton, Norwalk, Oberlin, Ohio City, Olmsted Falls, Parma, Penfield Township, Peninsula, Pepper Pike, Pittsfield, Polk, Port Clinton, Put-In-Bay, Remindersville, , Rittman, Rochester, Rocky River, Russell, Sagamore Hills, Salem, Sandusky, Seville, Shaker Heights, Sheffield, Sheffield Lake, Sheffield Township, Sheffield Village, Solon, South Amherst, South , Spencer, Strongsville, Tremont, University Heights, Valley City, Valley View, Vermilion, Wakeman, Wellington, Westlake, West Salem. Not on the above list? If you reside in Huron County, Erie County, Lorain County, Medina County, Cuyahoga County, Summit County, and western Geauga County then we probably work in your area. Give us a call at 440-323-7581, and we can quickly let you know either way. Our privacy fence, picket fences, and other spaced fencing designs are also available as a do-it-yourself kit. Why settle for a poor quality product from a box store, simply because you'd like to do the project yourself? Let us know what you need, and we're happy to put a DIY kit together for you! We do not ship our products. We only service the above listed areas of Northern Ohio.